Call for Professional Moving and Storage Needs! The most professional moving company in College Station and Brazos Valley is G & M Haulers Moving and Storage. We have everything you need to help you out during the aggravating, busy process of a full move. Our customers can contact us to hire our movers to handle every aspect of your move into a new home. We also offer truck rentals for those who simply need a way to transfer all their stuff from one place to another. Best of all, our moving services are affordable for everyone. Whether you’re moving into a college dorm for the semester or have just purchased a new house, G & M Haulers Moving and Storage has all the moving solutions you need. G & M Haulers Moving and Storage has earned a reputation for its commitment to customer satisfaction. Our customers have been wowed by our professionalism and expertise. We do everything we can to make the moving process easier for you. Most importantly, we take extra special care of all your belongings to make sure they are handled properly and are never lost or damaged. If one of your items is somehow damaged or lost, we will cover the cost for repairs or replacement. 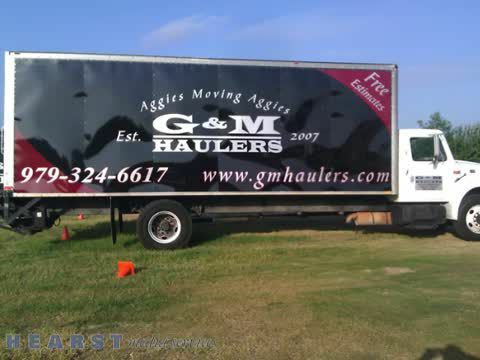 G & M Haulers Moving and Storage was originally founded in 2007 by two Texas A&M students who wanted to make the moving process simpler for fellow students in College Station. In the years since, customers have been able to count on G & M Haulers Moving and Storage for fast service that is affordable. 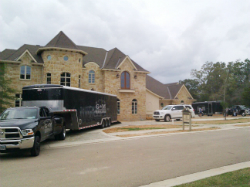 They have continued to grow and are now one of the top moving companies in College Station. We ask customers to compare our rates with our competitors to see who offers the most for the most affordable amount. More often than not, the answer is G & M Haulers Moving and Storage. When you contact G & M Haulers Moving and Storage for moving services, you can request the specific number of movers you need to help you, as well as the size of the truck you need to move all your stuff. We offer 12-foot trailers, 20-foot trailers, 24-foot trailers and 36-foot trailers and we can provide up to four of our movers to help you out. G & M Haulers Moving and Storage has partnered with Penske Truck Rental to provide the finest in moving truck services. G & M Haulers Moving and Storage is known as one of the best student movers in College Station. If you are moving in for a semester at Texas A&M, G&M can handle everything that needs to be moved onto campus dorms. No other Aggie moving company can match the service we offer for Texas A&M students. Trust our team for any kind of residential or commercial move! Other customers in College Station and Bryan trust us for moves to and from houses and apartments. As apartment movers, we can move everything you need up and down the stairs of your building, make sure they safely arrive at the new apartment, and are set up the way you want. 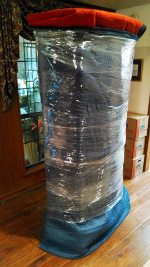 We are antique movers who specialize in the care of delicate, antique items. If you have an antique dresser, grandfather clock, grand piano or other antique valuables, G&M can make sure these items are moved with care. Customers with motorcycles, four wheelers, jet skis or other motorized vehicles can trust us to move or store these heavy-duty items for them. Our trailers are equipped to handle anything. Those looking for moving supplies can also ask us to provide boxes, bubble wrap, tape, packing paper and covers for mattresses and sofas. G&M is the moving company to trust for residential and commercial moving, whether it’s across town to a new apartment, out of town to a new house, or into a dorm at a college campus. Get in touch with us ahead of time if you’re planning a move by calling 979-314-2454. Keep in mind that we tend to be busy at the end of spring, as school ends for the year and throughout the summer, up until the time college students return to campus in August.